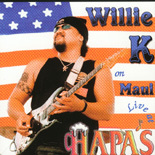 - If you know Hawaiian Music, then you gotta' know Willie K! Considered by many as one of the best guitar players in the nation, Willie K shows us his diversity and incredible talent. Willie's legendary voice and guitar really crank on this double CD! Live is what he does best and being an outstanding entertainer, he can play everything from Hawaiian to Hendrix, Hard Rock to soulful Blues.